I'm currently working on a book for the adult nonfiction market. 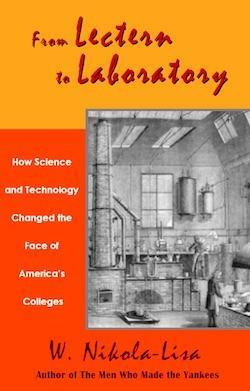 It's titled From Lectern to Laboratory: How Science and Technology Changed the Face of America's Colleges. In it I examine the stranglehold that the classical liberal arts curriculum had on America's colonial and early antebellum colleges, relegating anything that smacked of the useful or practical arts (i.e., applied science) to the dustbin of education. Changes in the American economy after the successful resolution of the War of 1812, however, highlighted the need not only for skilled manual workers, but also for a wide range of highly-trained professionals, especially to design, supervise, and manage large-scale construction and manufacturing projects. From Lectern to Laboratory discusses how these needs helped reshape the landscape of the college curriculum, giving rise to new programs, departments, and schools of science and techology at some of the oldest academic institutions in the country.